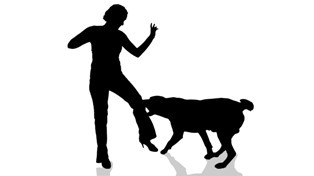 Dog attacks are often sudden and unexpected, but can result in serious injuries. Depending upon the circumstances, California law allows dog owners to be held both civilly and criminally liable for dog bite injuries. However, you'll want to consult a personal injury attorney to help maximize your chance of receiving the accident-related compensation you deserve. A dog that attacks a pedestrian, runner, or cyclist is responding to his natural prey instinct. When a dog sees an intruder enter his territory, he'll bark to defend his personal space. The intruder is already planning to leave, but the dog does not know this. Seeing the intruder leave creates reinforcement of the barking behavior and makes the dog slowly become more aggressive each time someone wanders by. If the dog's owner doesn't keep this behavior in check, the animal may eventually progress to biting or otherwise attacking someone. When a dog bites after being pet or played with, it's because he views the victim's behavior as a threat. Dogs generally do not like to be distributed when they are sleeping, eating, chewing on a favorite toy, or caring for their puppies. Since they can't express their feelings in words, they'll use body language to signal their anger. A dog who is feeling agitated may have a tensed body, stiff tail, furrowed brow, and a pulled back head or ears. He may also be staring intensely, flicking his tongue, or trying to back away. If this body language doesn't stop the undesirable behavior, the dog may bite as a final form of expressing his displeasure. Different dogs have different temperaments, just as no two people are alike. Pit bulls and Rottweilers tend to get labeled as overly aggressive—but the reality is that any dog that's not been trained properly can bite if provoked. All dogs need positive reinforcement, consistent correction of aggressive behavior, and plenty of opportunity for exercise. If you are attacked by a dog, the safest course of action is to give the dog your purse, backpack, or bicycle to put a barrier between you and the animal. If this isn't possible, remaining motionless and resisting the urge to scream is the best way to protect yourself from dog bite injuries. If you fall, curl into a ball with your hands over your ears. Seek help as soon as the dog loses interest in you. Any dog bite will require medical attention. Your care provider will wash and clean your wounds, giving you stitches if necessary. Wounds will be dressed with antibiotic ointment and sterile bandages to reduce the risk of infection. Tests may be done to rule out the possibility of nerve or muscle damage. Your care provider will want to locate the owner of the dog to determine if the animal has received all his vaccinations, including a rabies shot. Being bitten by an unvaccinated dog will require you to receive more extensive treatment as a precautionary measure. California has what's known as a "strict liability" dog bite policy. Under state law, owners can be held liable for dog bite injuries as long as the injured person was in a public place or lawfully in a private place when the attack occurred. Owners can be held civilly liable for dog bites regardless of whether they knew the dog was prone to aggressive behavior. However, owners may face additional criminal liability if they have a dog that qualifies as "dangerous" or "vicious" based on past behavioral problems. In most cases, compensation for dog bite injuries is paid from the owner's homeowner’s insurance policy or as part of a special pet owner's insurance policy. However, you're entitled to seek reimbursement for damages—even if the owner of the animal who bit you has no insurance. If you have been injured as the result of a dog attack, you will want to retain an experienced personal injury lawyer to advocate for your right to compensation. The dedicated attorneys at Inland Empire Law Group are committed to assisting California residents in obtaining the compensation they need to recover after a dog attack. Please call (888) MY IE LAW to schedule a free, no-obligation consultation at either our Rancho Cucamonga or Victorville offices.